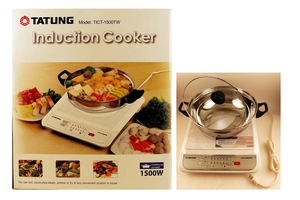 Tatung Induction Cooker with Cooking Pot and Glass Cover. Perfect for dorm, office, or any desirable indoor place. No open flame, safe and convenience. High heat resistant and easy to clean. Ideal for regular cooking or party events.